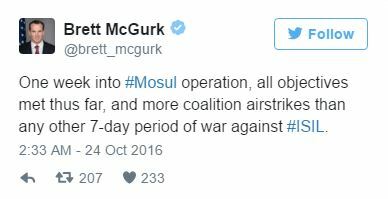 ISIS has been hit with more airstrikes than any other 7-day period in the war against the Islamic State. Brett McGurk, leader of President Barack Obama’s counter-ISIS coalition, has confirmed that this is the largest quantity of attacks carried out in a single week throughout the entire war on terror. The battle for Mosul has led to nearly 1,800 bombs, artillery rounds, and rockets being dropped on ISIS targets surrounding Mosul from October 17, 2016 to October 23, 2016. 136 of the extremists fighting postilions, 60 pieces of artillery, 82 vehicles, and 26 car bombs belonging to ISIS were destroyed in the process. U.S.-led forces were also able to collapse 18 tunnels used by the terrorist organization. 78 Villages and towns were reclaimed from ISIS as of Monday October 24, 2016. ISIS fighters have increased the number of attacks against Iraqi and Kurdish forces in response to the airstrikes.